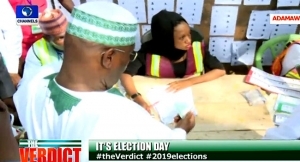 Presidential candidate of the Peoples Democratic Party (PDP), Atiku Abubakar, has voted in the Presidential and National Assembly elections. The former vice president and his wife were accredited at 10:01 and he voted a few minutes later. After voting, the PDP candidate said he is impressed with the turnout of voters. INEC Releases Timetable For Senator Dino Melaye’s Recall. APC To Send Reps To Atiku Over Grievances, May Sanction Ex-VP If Found Guilty.